Laptops 15-inches and smaller will fit in the inner sleeve. Measures 21 1/2-inches long x 14-inches tall. Features side panels for durability and protection. A large courier style messenger bag with details based on UNSC Infinity crew dress uniforms in Halo 4, this Halo 4 UNSC Infinity Messenger Bag measures 21 1/2-inches long x 14-inches tall. The inner laptop sleeve fits laptops 15-inches or smaller. 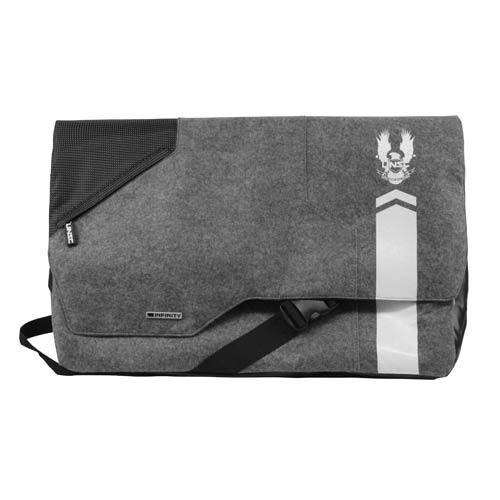 With a detachable swivel-clip key chain, a silicone-coated fabric bottom, side panels for durability and protection, a wool and nylon exterior fabric, and a gunmetal Infinity logo tag, the Halo 4 UNSC Infinity Messenger Bag will not only look cool to fellow Halo 4 players but to everyone else, too! Ages 14 and up.